Maybe you’re curious about Kansas Farmers Union or the Kansas Beginning Farmers Coalition? Join us for a casual introduction to the KFU family! If you’re already a KFU member, bring a friend! Both farmers and consumers are welcome. Membership in KFU is not required to attend. We’re gathering members and friends for an evening of local food, conversation, and informal dialogue…Curious about Kansas Farmers Union or the Kansas Beginning Farmers Coalition? Join us for a casual introduction to the KFU family! If you’re a KFU member, join us and bring a friend! 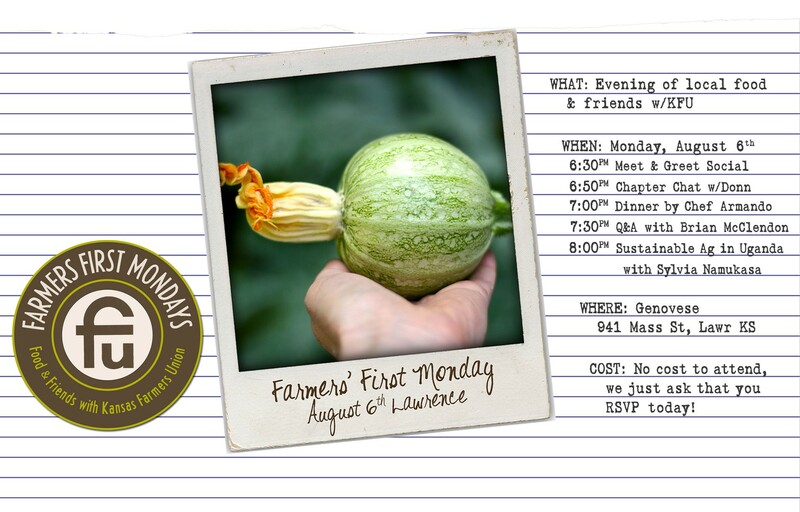 Kicking-off the inaugural Farmers’ First Monday is an optional tour of Lawrence Organics, a partnership of Moon on the Meadow and Mellowfields Farm. Lawrence Organics occupies about 6,000 square feet of the approximately 30,000 square feet greenhouse complex at the Sunrise Project. The company grows a variety of greens that it primarily sells to restaurants and other larger buyers. The Sunrise Project is focused on food, community and empowerment. The organization provides programming for youth focused on farm-to-preschool, gardening and hands-on cooking, and it coordinates related educational and community-building events for both youth and adults on-site. Earlier this year, they also launched Sunrise Coffee, open 8am to 5pm daily. The old Sunrise Garden Center is also home to Seeds from Italy.